You know what they say – “calmly redirect”. Here are three singing games and tickles to change grumpy toddlers’ moods and keep your own spirits high. When I say handling toddlers, I really mean it. Putting your hands on them to play games really is therapeutic because touch is their most important neural pathway. You can help them to organise their brain just with your loving touch. However, always use your best judgement. If a child is unwell s/he may not want to be tickled or held upside down! Practise giggling, you do it first, see if you can get them to copy you. Substitute your child’s name instead of “Elsie Marley”. Lie on the floor with the child pretending to sleep. (Substitute the word “sleepy” if you don’t like the word “lazy” originally used in this old English nursery rhyme.) Music and activity for Elsie Marley is available from the Musical Child store. Keep the beat of the song by pointing your index finger or by lightly patting the child. Do it again and let the child tickle you, or themselves or a favourite toy. Here’s another great floor game. Sit on the floor next to the child with your legs out straight. Pull off one shoe and if the child wants to, s/he can too. Music and activity for Diddle Diddle Dumpling is available from the Musical Child store. Tickle them on the words “Diddle diddle dumpling” or if they are still being grumpy toddlers, rock sideways for the first line. Run your hands up and down your legs as you sing the word “trousers”. Hold up the appropriate foot as you sing the word “shoe”. Repeat the first action as you sing the last line. Catch another for my brother. If you are with a single child and s/he will let you hold them upside down, do version 1. If you have a group, do version 2. Music and activity for Down at the Bottom of the Deep Blue Sea is available from the Musical Child store. Version 1. Sit in a chair and ask the child if they want to go down to the bottom of the sea. Hold the child on your lap facing you, each of your hands joined firmly to each of the child’s hands. Feel comfortable and confident that you can drop and lift the child up during the game. Bend over and sing the song looking into his/her face. 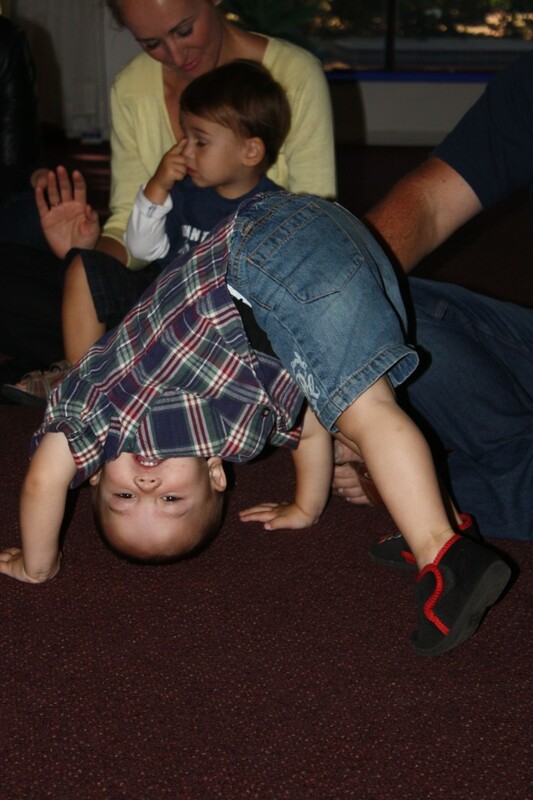 These Games and Tickles were taken from the Musical Child Toddler Music Program. You can find them in the Lesson Plans “Baa! Moo! Oink!“, “In the Big Bed” and “Up and Down” from the Program Bounce and Sing for 1 to 3 year old children published by Musical Child, the perfect place for you to learn how to teach preschool music and forever change grumpy toddlers to happy little kids. Buy Games and Tickles today!